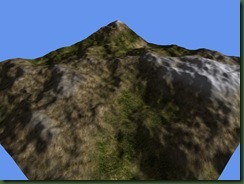 In this chapter, we will see how to create a terrain that morphs between two heightmaps. Some ideas for using this effect could be interesting transitions between levels, an animation while travelling through time billions of years, or some natural disasters and earthquakes. I’m sure you can think of plenty of other uses for this. Also, one of the techniques covered in this chapter opens the way for the other effects seen later in this tutorial. To morph between two heightmaps, we need, obviously, two heightmaps. We’ve seen before that each vertex corresponds to a pixel in the heightmap. To morph the terrain, we need to interpolate between the corresponding height from the first heightmap, and the height from the second heightmap. This interpolation will be done based on a number between 0.0f and 1.0f. So, if we smoothly modify the number, the terrain will appear to transform smoothly from one shape to the other. From now on, we will refer to this number as a morph factor. Now we can begin to see the advantages of using the GPU for this operation. If this was done on the CPU, the vertex buffer would have to be modified each frame, which is a costly operation. The XNA guys have done a great job with the framework, and using DrawUserIndexedPrimitives or DrawUserPrimitives helps a lot in not dealing with dynamic vertex buffers, but we would still want to do this on the GPU, if possible. There are two ways to achieve the desired result. The first method will read inside the vertex shader the heights from the two heightmaps, and interpolate between them. We begin with the code from the previous chapter. Add height2.dds to the project, in the Textures folder. Then add a member for it in Game1.cs and load it with the texture in the LoadGraphicsContent function. In the effect file (VTFDisplacement.fx), add a new parameter, of type float, named morphFactor, and the texture and sampler for the second heightmap. In the vertex shader, we will read the heights from the two heightmaps, and interpolate between them, as said earlier. The last thing we need to do is set the values for morphFactor and displacementMap2 parameters from the application’s code. So, go in the Game1 class, and inside the Draw function add the following lines. We use a sin function to repeat the smooth transition between the two heightmaps. Running the program now, will show our terrain morphing. This approach was easy to write, just a few lines of code. Unfortunately, as you might have noticed, the performance was pretty bad. The main reason for this is the fact that inside the vertex shader, we read the two heights. Since each read takes 4 samples from the texture, that makes for a total of 8 vertex texture reads per vertex, which slows down the process (remember that reading from a vertex texture is nowhere near as fast as reading from a texture in a pixel shader, yet). In order to avoid this, we can eliminate bilinear filtering. This brings us down to 2 texture reads per vertex, but we loose the smoothness resulting from the filtering. Next, we will see how to preserve bilinear filtering, and have a good performance at the same time. The following method uses a technique called Render To Texture . Before drawing the terrain, we will use the two heightmaps, and combine their colors in a pixel shader. The result will be an interpolation between the two of them, based on the morph factor. Instead of drawing the result to the screen, we draw it onto a texture. After this, we draw the terrain as we did before, but we use the newly created texture as the displacement map. Creating the interpolated heightmap is very fast, since it is done using a pixel shader, so the terrain shader can still use bilinear filtering, and the performance is kept high. To begin, we need to use the VTFDisplacement.fx effect, as it was at the end of the previous chapter (remove the second displacement map and the interpolation). Create a new file, inside the Shaders folder, name it TextureMorph.fx, and open it. We need to add two parameters for the textures we are combining, and the samplers for them. We need to add the morphFactor parameter, and then we create a pixel shader in which we combine the two textures. We interpolate between the two colors, based on the morphFactor, just as we did previously in the vertex shader. For simplicity, we will use a SpriteBatcth to render our interpolated texture. Because of this, the technique we defined, called TextureMorph, only contain a pixel shader, because the vertex processing is done for us by the SpriteBatch code. The Sprite Effects sample also shows how to use SpriteBatch with custom shaders, but you do not need to study the sample in order to continue, because we will cover all the necessary code. Let’s move forward, and open the Game1.cs file. Add the following members to the class. The morphEffect member will be used for loading the effect file created earlier (TextureMorph.fx), morphRenderTarget, morphDepthBuffer and morphSpriteBatch will be used for Render To Texture, when creating the new heightmap. Next, in the LoadGraphicsContent, we have to initialize them. We use 256 for the size, because this is the size of the heightmaps. Now, let's create a new function, that takes a float as a parameter. Inside this function we will use Render To Texture to obtain the new heightmap. First, we need to save the current RenderTarget and DepthStencilBuffer set on the device. In our case, the RenderTarget is null, but if we want to use this in a real game, there’s a great chance that this would be some other RenderTarget, used for post processing, or letterboxing, or other uses. So, we will assume we don’t know its value, and save it. After this, we set our own RenderTarget and DepthBuffer. Next, we clear the render target, we begin drawing, and set the effect parameters. We draw the displacementTexture over the whole RenderTarget. While drawing, our pixel shader will be applied, and the interpolated heightmap will be created. Lastly, we need to resolve the RenderTarget, and set back the original values for the RenderTarget and DepthStencilBuffer. In the Draw function, we call this function and then we restore the necessary Render States (that were modified by the spriteBatch). For the gridEffect, we need to set the displacementMap parameter to the newly rendered texture, which can be accessed by morphRederTarget.GetTexture(). If you run the code now, you should get the same morphing terrain as before, but the performance is much better. Now let’s analyze the technique we used. The vertex texture fetches were kept to a minimum, the effect was dynamic, which would otherwise have meant modifying the vertex buffer each frame. The morphing itself was done very fast, in a pixel shader. Looking at this, we can see that we could theoretically add very much complexity to the Render To Texture step, and the performance would stay high. 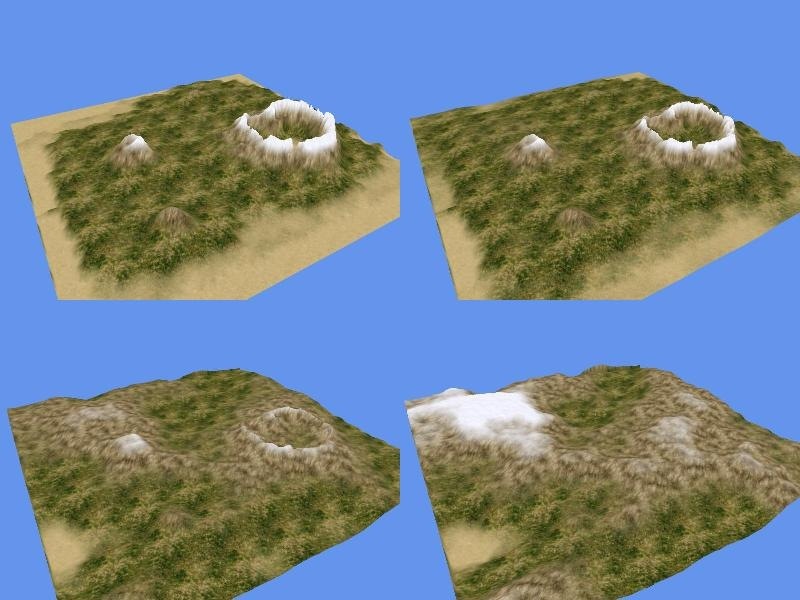 One possible scenario would be to use the render-to-texture step to add dynamic deformation to the terrain, like holes made by explosions, waves of land moved by earthquakes, and with some effort, even moving dunes of sand. All you would have to do is manipulate the displacement map before feeding it to the terrain shader. This code will be used to generate the normal map. Now, we need to add code for lighting in the terrain shader. Open VTFDisplacement.fx, where we need to add a direction for the light, and a texture and sampler for the normal map. Since we will access this in the pixel shader, we can use bilinear filtering. We need to modify the pixel shader, to include lighting calculations. We will use a simple L * N formula for the light, and an ambient light of 0.2f. The last bits we need to add are in Game1.cs. We need a new RenderTarget2D, for the normal computations, and initialize it. The function used to compute the normals is very similar to Render2TextureMorph. We need to call it after updating the heightmap, and then the generated normal map has to be passed as a parameter to the terrain rendering shader. morphEffect.CurrentTechnique = morphEffect.Techniques["ComputeNormals"];      // select the technique for computing normals. For further improvements, the normal map can be combined with some generated noise, to produce the impression of small bumps over the ground, for higher detail. This ends the second part of this tutorial. We saw how to have dynamic morphing terrain. Using Render-To-Texture can increase performance, and can open the way to lots of special effects, like deformable terrain. We also saw how normals can be computed in real time from the heightmap, and applied to the terrain. For the next chapters, we will leave terrain rendering behind, and cover other interesting effects. The complete source code for this chapter can be found in Chapter2.zip. I was to start using your terrain code for my game 3D engine so I downloaded the code to see that it worked properly before implementing it in my own engine. But when i compiled it everything looked good until it came to the Render2TextureMorph part of your code, and here it says “Both a valid vertex shader and pixel shader (or valid effect) must be set on the device before draw operations may be performed”. Have you heard about this problem before, and do you know if its fixable or is it that my graphics card don’t support this type of code? It’s probably your video card. Well back to the net to find a tutorial for terrain again then. I have a weird problem with the implementation of the lighting. I have an ATI card on my laptop, so maybe it comes from that, and I didn’t have time yet to try my “game” on another computer. That’s strange. Do you use SpriteBatch anywhere in the code? that might mess up some texture addressing variables.